ARE YOU EATING HALAL WHEN YOU GO OUT? Yes this is the IslamAwakened you are familiar with; all of our Qur'an Pages are here. We had to mitigate a hack attack, but good backups preserved all of our essential material. We have also moved to the use of https for your security, and ours. The links to our Qur'an content follow, unaffected. The remainder of our articles will be brought over as time permits. Remember, you can give us feedback on our Facebook page as needed. And JZAK for all of your support! Do you want to help keep us online? The following is a index to all 6,236 verses of the Qur'an (not counting the "Bismillah"s in 112 verses). O YOU who have attained to faith! No men shall deride [other] men: it may well be that those [whom they deride] are better than themselves; and no women [shall deride other] women: it may well be that those [whom they deride] are better than themselves. 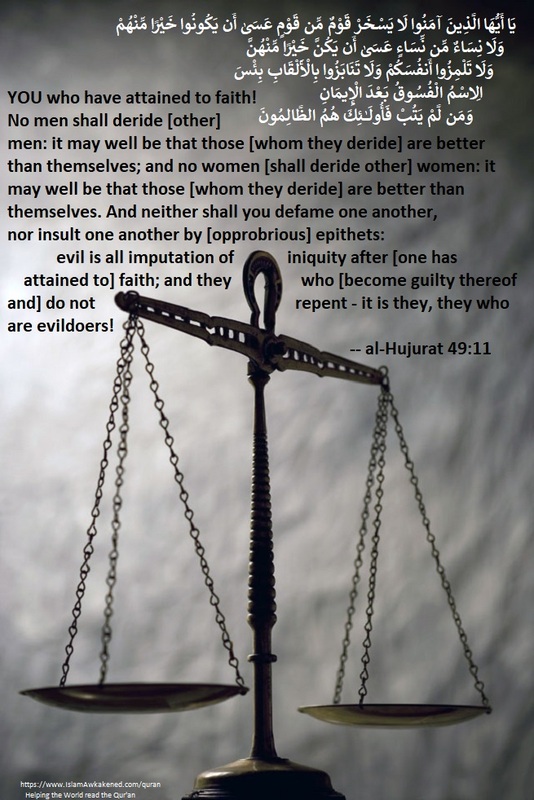 And neither shall you defame one another, nor insult one another by [opprobrious] epithets: evil is all imputation of iniquity after [one has attained to] faith; and they who [become guilty thereof and] do not repent - it is they, they who are evildoers! We must always read the verse(s) for ourselves!